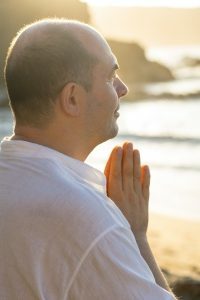 Sahajananda, the main founder of Hridaya Yoga, is a meditation and hatha yoga teacher with over 30 years of experience. His message conveys the non-dual tantric teachings. An engineer in electronics by education, Sahajananda started practicing yoga and meditation in 1981, the year in which yoga was banned in Communist Romania. This fact only brought him more depth, determination, and spiritual aspiration. At age 14, the revelation of true Love came when he first met Simona. This sparked the first inspirations regarding the core message of Hridaya. Her presence was both an inspiration and a guide for what sacredness and wonderment of the world mean. Before knowing any formal meditation method, they spent many hours together contemplating the sea, the sky, and the flowers. Simona continued a very similar journey and, much later, contributed to the creation of the Hridaya Yoga vision. Sahajananda’s yoga master was Grieg, an adept of tantra yoga. In 1989, after the fall of the Communist regime in Romania, thousands of people expressed their interest in Eastern spirituality and yoga. In response to their aspirations, a yoga school was created, the Movement for Spiritual Integration into the Absolute (MISA, per its initials in Romanian). In addition to being a yoga teacher, Sahajananda was the director of the Sofia Publishing House and for many years, he coordinated three monthly magazines on the topics of yoga, mysteries, and tantra. Sahajananda also served as vice-president of MISA, supporting his teacher and playing an important role in developing the yoga school. He witnessed MISA’s ascension but also its limitations – the emphasis on power, sexuality, etc. So, together with a group of other yoga teachers, Sahajananda left MISA in 2006. 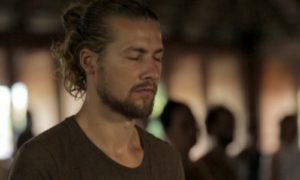 Later in 2006, he started giving monthly silent meditation retreats at Agama Yoga in Koh Phangan, Thailand. In 2011, Sahajananda, together with Antoaneta, designed the Hridaya Teacher Training Course. 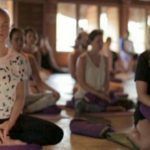 The course was created for spiritual aspirants who want to deepen their meditation and yoga practice and share the Hridaya message of Self-awareness. In 2012, Sahajananda, helped by Antoaneta, Claudiu, Nicholas, and many other Hridaya teachers, created the headquarters of the Hridaya Yoga School in Mazunte, Mexico. In addition to classical yoga and meditation, in the mid-1990s, Sahajananda started systematically practicing lucid dreaming and astral projection. His aspiration was to contact the sacred realm of Shambala and serve the world. It was a period of ecstatic experiences, visions, and revelations. He shared his insights and methods in a series of 8-week workshops on Spiritual Techniques and Parapsychology. The efficiency of this program made the Ecological University in Bucharest offer him the position of Professor of Parapsychology. Later, he understood that even this approach (the exploration of the subtle worlds) still involved the mind and, therefore, is often restricted by personal filters and limitations. He understood that “Silence is the language God speaks and anything else is a bad translation,” as Thomas Keating said. Thus, he started doing solitary meditation retreats in caves in the Carpathian Mountains. During these times of solitude, Sahajananda was humbled and charmed by the directness of Self-enquiry, the method recommended by Ramana Maharshi. In one of these retreats, the mind stopped functioning in its ordinary way and a deeper and wider sense of existence was revealed – an understanding that shone blissfully for days and nights, bringing the evidence of eternity. This event brought him a direct understanding of Oneness so vivid and obvious that for a few years he could hardly approach any kind of meditation or spiritual practice other than Self-enquiry. Additional solitary retreats brought a more obvious understanding that this message can and should be transmitted, but it requires the dedication, discipline, and surrender of a silent retreat. Thus, since 2001 he has been guiding people in retreats, leading a 10-Day Hridaya Silent Meditation Retreat each month. Find out about the meaning of Sahajananda’s name here. Read an interview with Sahajananda about the path of Self-enquiry here.